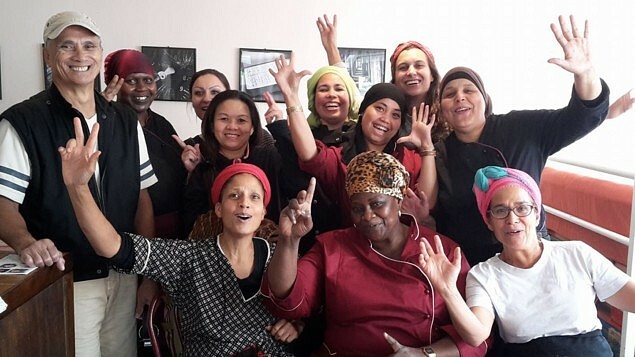 Le Mam’Ayoka, a community restaurant and caterer, helps people with cooking skills, but no qualifications, to get permanent jobs and offers tasty meals which reflect the ethnic diversity of the different districts of Paris. The cooks prepare their specialities, which can be eaten at the cooperative or delivered by bike. Community focused and responsible, all their meals are made with fresh produce. The 15-person collective, motivated by social entrepreneurship and an alternative model of consumption, showcases the cultural diversity of Paris and the associations, social centres and local community groups. The portraits produced for Mam’Ayoka, highlight the individuality of each cook. Mam’Ayoka won the Paris social and community economy award (ESS) 2017.